Border Patrol agent Tom Pittman and two National Geographic crewmen prepare to enter a parking-lot tunnel in downtown Nogales. It's a beautiful morning in downtown Nogales. 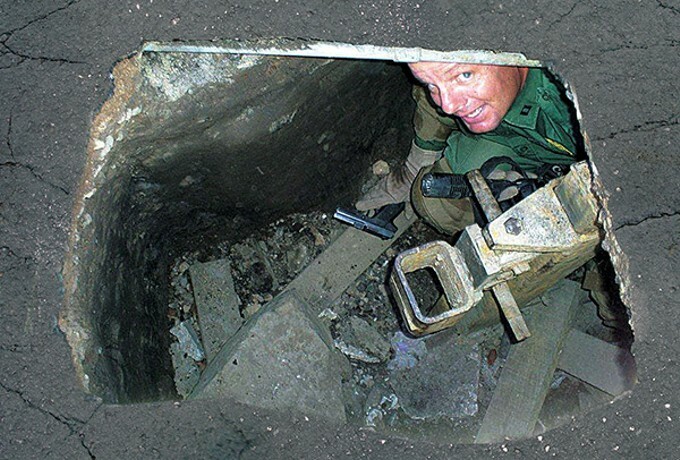 Border Patrol agent Kevin Hecht is preparing to lead a National Geographic film crew into the blackness of a cross-border drug tunnel, so narrow that he has to remove his gun belt to navigate it. But first, he wants to make sure no traffic passes on the road above while he is inside. "A catering truck went over my head the other day, and the vibration was unbelievable," says Hecht. "Every little bump in the road is magnified when you're down below." After bike-patrol agents halt traffic, Hecht, the cameraman and Hecht's partner, Tom Pittman, disappear into the tiny hole. "If you hear me screaming, don't worry," jokes Pittman on the way in. "It's just the cockroaches. Man, I hate those things." The tunnel was discovered late last year after a Nogales police officer saw a vehicle parked over a hole in a parking lot near the border. The driver of the suspicious vehicle was able to disappear into traffic before the patrol car could respond. The police notified Border Patrol, and Hecht and Pittman, two of the agency's so-called tunnel rats, are now working to shut down the underground passageway. It was good police work on both ends. But the more important story is about economics, not law enforcement: Border tunnels can mean huge money. Last Nov. 2, on the California-Mexico border, federal officials busted an 1,800-foot super-tunnel beneath Otay Mesa. It surfaced in a warehouse near San Diego, where investigators found 16 tons of dope. They took down another 10 tons in a trailer that had just pulled onto the highway. If the tunnel hadn't been found, the smugglers would have shipped 25 tons—in one day. "If it took $1 million to $3 million to build that tunnel, they were getting their investment back in a week, easily," says Tim Durst, assistant special agent in charge of homeland-security investigations for Immigration and Customs Enforcement in San Diego. "They can make huge profits in a short time in a sophisticated tunnel like that." Three weeks later, on Thanksgiving, authorities found a second tunnel containing 20 tons of marijuana. This one began in Tijuana, plunged 90 feet underground and stretched almost a half-mile under the border. It had lighting, ventilation and a rail-car system for moving loads quickly. Speed is key for the cartels, says ICE's Kevin Kelly, Durst's counterpart in Nogales. "They want to move their narcotics as quickly as possible," he says. "Nobody likes to keep a load waiting and risk getting hit by law enforcement, either here or on the south side." With the 161-foot Nogales parking-lot tunnel, no one knows the quantity of drugs that passed through it, in what the Border Patrol estimates was fewer than 72 hours of operation. But even such no-frills passageways can accommodate good-sized loads. The same day that Hecht and Pittman, a supervisory Border Patrol agent, are working the parking-lot tunnel, a crew prepares to close down another rudimentary tunnel on the eastern edge of downtown. In this case, the smugglers—in their final crawl-through before getting arrested—had pushed 665 pounds of dope, with a street value of $532,000, through what basically was a gopher hole. 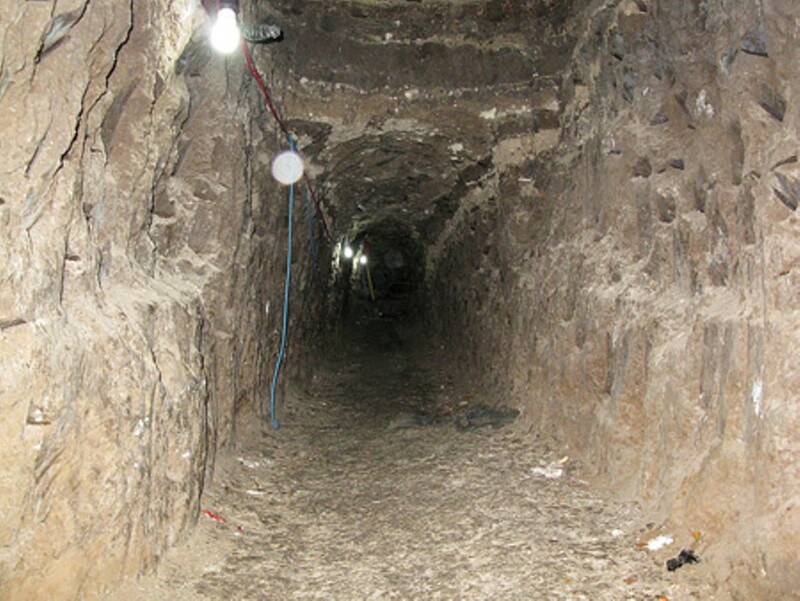 Did the closing of these tunnels seriously impact the cartels that ran them? Don't count on it. The dope was likely written off as an anticipated loss. What about the smugglers taken off the assembly line? A minor labor issue. Mexico is brimming with people willing to risk their freedom and their lives pulling duty in airless, stifling-hot, roach-filled holes, for maybe $300 a run. The tunnels being filled with cement? A mere transportation glitch, easily overcome. Mexico also has a limitless pool of laborers, many of them unemployed mining engineers, willing to go right back to work digging the next one—which, we can say with certainty nearing 100 percent, is happening in Nogales right now. Drug tunnels are where greed and criminal ingenuity meet relentless American demand. "Tunneling on the border has taken off in the last five years," says Durst, head of a multi-agency, border-wide tunnel task force. "The San Diego-Tijuana area comes in second for tunnel discoveries, with Nogales at No. 1. Nogales is the hotspot." It has earned the dubious title of tunnel capital of the Southwest. Think of Nogales, Ariz., as one bustling city above another. Subterranean Nogales exists within the elaborate maze of storm drains built following severe monsoon floods in 1930 and 1931. They're essential to the town's survival. They keep Nogales from disappearing in the rain water that roars off the higher ground of Nogales, Sonora, and surges north through the pass that cradles both towns. But the drains are also a kind of office park for smugglers. With illicit tunnels tapping into hundreds of existing drains, the total network is extensive, giving rise to jokes that the town might someday fall into a giant sinkhole. The wisecracks aren't far off. Last August, a cross-border tunnel weakened the ground at the DeConcini Port of Entry, causing a passenger bus to collapse the street beneath it. Hugh Holub, a former Nogales city attorney now semi-retired in Tubac, once joked that Nogales should offer drug-tunnel tours as part of the tourist effort. Within days of Holub's joke, the Discovery Channel was on the phone with the Chamber of Commerce wanting to schedule a tour. "The chamber was not amused," says Holub. "It's like we have giant termites digging around underneath town." The "termites" have been busy over the last four years. Of the 77 tunnels found in Nogales since 1995, 55 of those have been discovered since 2007. The busiest year was 2009, when 20 were discovered, according to Border Patrol figures. Eleven have been discovered in the past two years. ICE and Border Patrol officers argue that more technology, more agents and better fencing have forced the smugglers below ground. "We've gotten to where the smugglers react to us, rather than us reacting to them," says Border Patrol spokesman David Jimarez. "Tunneling is a sign of their growing desperation." Anthony Coulson, former head of the Drug Enforcement Administration in Southern Arizona, says there is some truth to the claim that better enforcement at the ports of entry has pushed the cartels underground. After all, tunnels have significant negatives—the time they take to build, the high cost and their relatively short life span. But claims of cartel desperation are overblown. A report released in March 2010 by the National Drug Intelligence Center, part of the Department of Justice, states that the availability of heroin, meth and marijuana in the U.S. is "widespread and increasing," due mainly to the ability of the Mexican cartels to get their product across the line. Only the supply of cocaine has decreased. "The amount of drugs we seize in the four border states keeps increasing," says Coulson. "Some say that's a sign of success. I say it's a sign of failure." 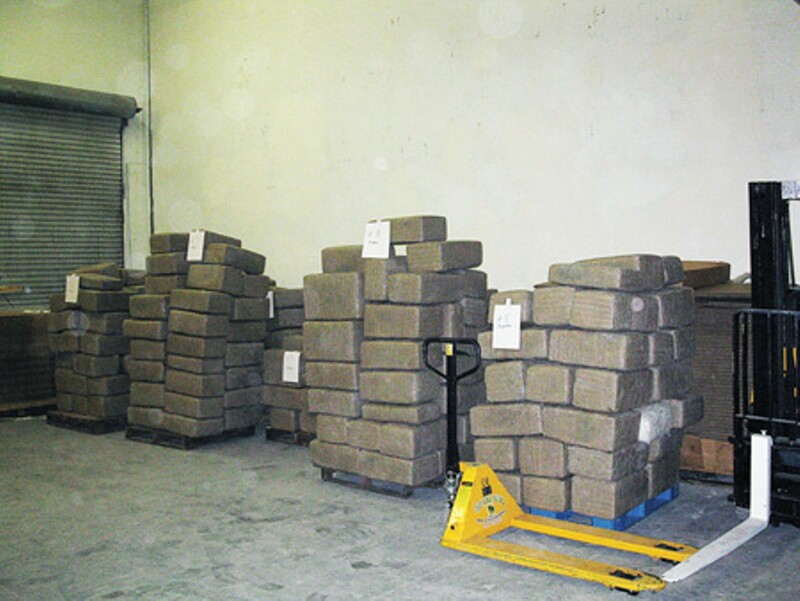 In the Tucson Sector in 2009, for example, Border Patrol seized 1.2 million pounds of drugs, the largest haul ever. 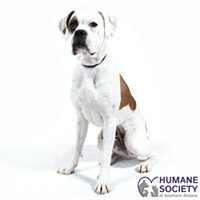 In 2010, the number dropped to slightly more than 1 million pounds. Homeland Security officials like to tout such seizure numbers, because they are the only statistic they have to show effectiveness. But the numbers are meaningless, says Coulson, unless we also know the "total universe" of drugs being produced, and that is pure guesswork. Another important figure: The percentage of the drugs coming across the border that law enforcement is able to seize. Coulson says it is less than 50 percent, adding that the cartels plan to lose a set a percentage—say, 20 to 30 percent—to interdiction. They essentially hand over this amount to authorities, tying up the time and resources law enforcement has to commit. Coulson says the cartels then bump up production and blanket the "uncontrolled border" with dope to compensate for their losses. TV stations and newspapers jump into the game, at law enforcement's invitation, to photograph stacks of seized dope and write stories telling us how the bust came about. The result is falsely perceived as a win-win: The media get to feed the beast with an easy story, leaving the impression they're covering the drug war; law enforcement gets to look good for the public, leaving the impression enforcement is working. But if that were true, the supply of drugs would be dropping, with the street price going up. "Prices are as low as they've ever been, which is an indicator that we have a problem," says Coulson. He is not arguing against enforcement, but calls it a finger in the dike. "You don't want law enforcement taking its fingers out of the dike, because there would be a disaster," he says. "But it doesn't stop the problem." The cartels will continue to assault the Nogales border with every means at their disposal, from walking the desert and hiding drugs in produce trucks, to pushing them through tunnels. As the NDIC report notes, the recent increase in tunnels suggests the cartels consider them "useful investments to smuggle drugs into the U.S."
"There's profit in it, or they wouldn't do it," says Kelly. 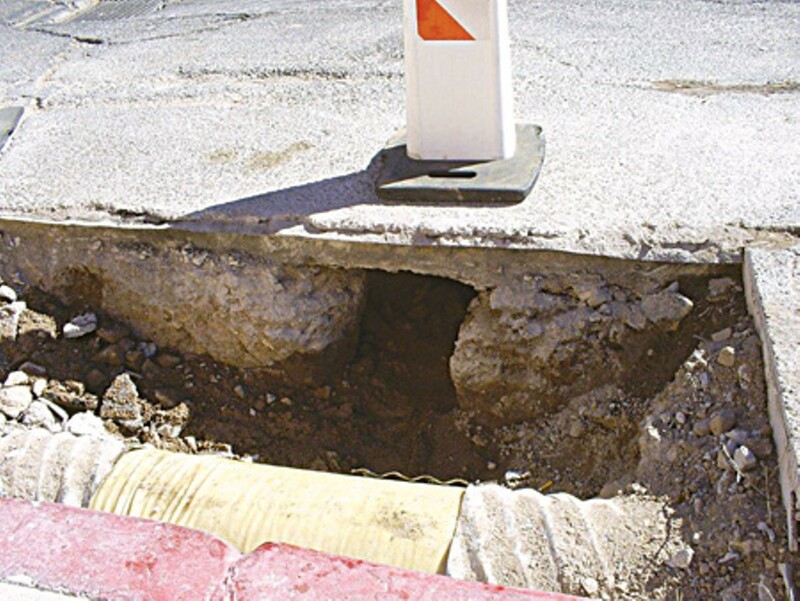 In downtown Nogales, a common method is to burrow beneath International Street, which parallels the border fence, punch a small exit hole in the pavement, and park a car above it. "Smugglers want to get quickly up to a roadway in a place like downtown, where there's lots of activity," says Nogales Police Chief Jeff Kirkham. "They try to blend quickly into the traffic flow and get away." In December, Nogales ICE agents busted a downtown tunnel that operated this way. 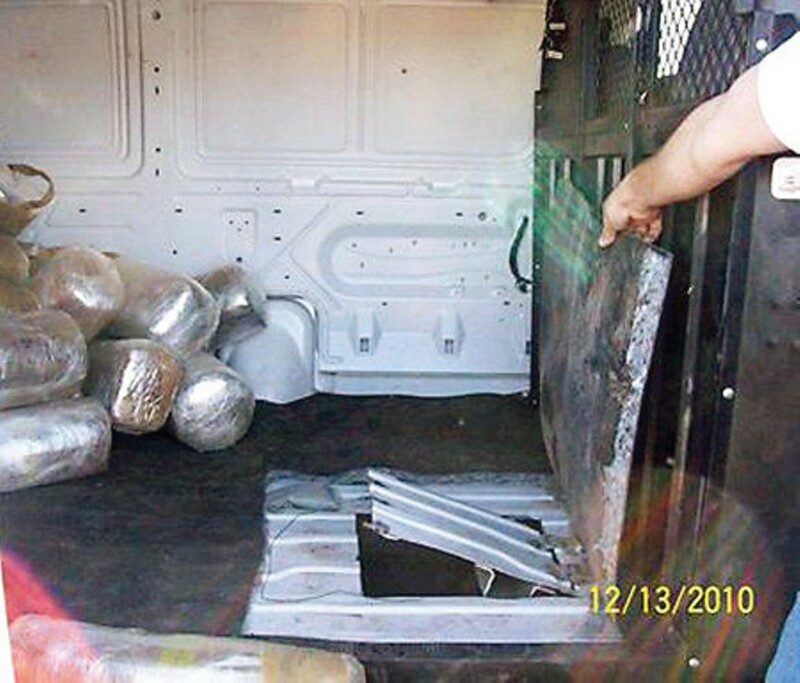 The drugs, packaged in bundles cylindrically shaped to fit neatly through the tunnel, were shoved up through a hole in International Street into a van with a trap door in the bottom. The parking-lot tunnel, 150 yards west of the DeConcini port, also relied on vehicle trap doors. The exit hole was a circular piece of cement raised and lowered into place by a manually operated jack cemented inside. Apart from the jack, a crude vent pipe and two-by-four shoring, the tunnel wasn't particularly impressive. It was 4 feet deep and probably took only two months to build. The workers stuffed the dirt they removed into sugar sacks that were dragged out with ropes. But they got lost along the way, as evidenced by a failed punch-up a short distance from the final exit hole. "They zigzagged around down there, trying to find a way to come up," says Hecht, assistant acting patrol agent in charge in Nogales. "I've seen much better craftsmanship. They did enough to get by, figuring it wouldn't be in use long." The easiest way to the surface is often through an existing sewer grate. As part of downtown patrols, Border Patrol's bicycle agents search for grates with cracks in the concrete around them, or other signs that the welds holding them down have been broken. Flavio Gonzales, the director of the Nogales Department of Public Works, didn't return calls to discuss the tunnels in his town. But Holub, who also served as interim director of public works in 2003 and 2004, believes most of the tunnels discovered in Nogales are not found by law enforcement. Rather, they're found by city public-works crews that stumble upon them while digging water and sewer lines, or doing road repairs. He says the numbers of tunnel discoveries is an unreliable measure of how many tunnels actually exist. "I'm absolutely certain there's an extensive network of tunnels under Nogales that we don't know about," says Holub. The Grand Avenue and Morley Avenue drainages are two key pieces of real estate in the fight for subterranean Nogales. These are covered, concrete drainages—big enough to accommodate a Chevy Tahoe—that start in Nogales, Sonora, and run parallel to each other underneath the border, separated by six city blocks. The drainages find daylight about a mile north of the border, eventually forming a Y and emptying into the Nogales Wash.
Holub says the smugglers try to use the drainages as passageways back and forth from Mexico, eliminating the need to dig underneath the border itself. A smuggler might rent a home in Nogales, Ariz., and burrow beneath a room into one of the city's storm drains, all of which feed into the Grand or Morley drainages. Law enforcement has struggled for years to secure these passageways, with limited success. At one point in the 1990s, gates were installed inside. But as soon as they went up, the smugglers got busy knocking them down. The fight is constant to stop illicit traffic in the drainages—whether it's people trying to enter the country illegally, bandits waiting to rob them, or drug smugglers moving loads through. On the Mexican side, Hecht says the Grand Avenue tunnel has cubbyholes where smugglers stash cement to conceal tunnel openings, tools, generators and even a wheel barrow dropped down through a manhole. 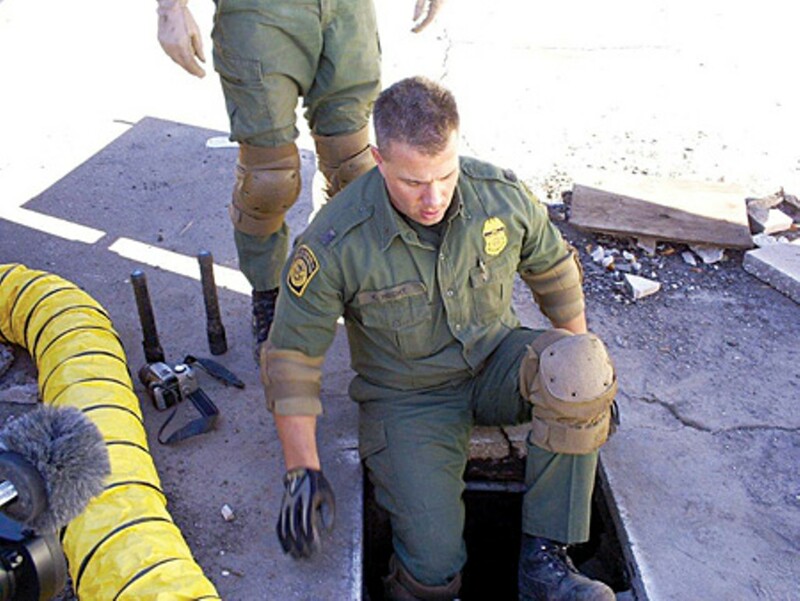 Border Patrol agents on the American side check both drainages daily, never sure what they might encounter in that strange, underground world. Pittman once ran into a teenager with an AK-47 guarding a drug load inside one of the feeder pipes. When Holub headed public works, repair crews were only allowed to enter Morley and Grand after a heavily armed SWAT officer cleared them first. He says city officials actually investigated buying some kind of military-surplus Humvee, with a bullet-proof lift-up plate, to protect workers entering the drainages. Shutting down the traffic in these two tunnels would require a constant law-enforcement presence. With raw sewage and a mix of toxic chemicals in the surface water flow, Holub says, it would be a nasty deployment requiring air packs to breathe and hazmat gear. "We used to joke that we should put up signs on the Mexican side saying, 'You will be sterile if you go into this tunnel,'" he says. "We didn't do it, because we knew it wouldn't stop them. Those tunnels are dangerous places, major security risks beneath Nogales." Durst says all border tunnels pose a "significant and viable" threat to the U.S. A Fox News report in February suggested an increasingly close connection between the Middle Eastern terror group Hezbollah and the Mexican drug cartels. The report noted a similarity between the increasingly sophisticated tunnels being built along our Southwest border and the tunnels used to smuggle weapons into the Gaza Strip. Durst, with other tunnel-task-force members, has traveled to Gaza to study tunnels there. While he says he has no information that tunnels have been used to smuggle terrorists or WMDs into the United States, he fears a drug cartel might get greedy enough to try. "It hasn't happened so far, because there's so much profit in moving drugs," says Durst. "But it's a threat we work hard to stop and desperately hope doesn't happen. We worry about it all the time." When Hecht, Pittman and the National Geographic cameraman emerge from the parking lot tunnel, they're filthy, breathing heavily and dripping sweat. Even with a ventilation machine pumping in cool air, the tunnel is a lousy place to spend a shift. Claustrophobia? As a four-year tunnel rat veteran with confined-space training, Hecht says he barely thinks about it anymore. "I just close my eyes, and me and Tom will talk the whole time about different stuff," he says. "We try not to focus too much on where we are." With filming work done, and the tunnel on the way to being shut down, the tunnel rats move to the east end of downtown. A construction crew is there working to fill with concrete the tunnel that agents found after seizing that 665-pound load. The tunnel ran under the border fence at the intersection of International Street and Nelson Avenue, a location that provides a vivid picture of the challenges law enforcement faces in policing underground Nogales. The two towns are set hard against one another. The land on the Sonoran side rises up from the line on a steep hillside dotted with houses, the nearest a little more than 100 feet from buildings on the American side. Agents know that some of those houses are cartel-controlled—either lookouts or stash houses—and have been used for tunnels in the past. But the Nelson-International tunnel actually began in the thick brush of a vacant lot. The diggers burrowed underneath the border fence and the intersection, the tunnel so shallow that its roof and the busy street above were separated by a mere 2 1/2 inches. After burrowing for 43 feet, the diggers broke into one of the city's drainage pipes. They crawled inside this 15-inch-wide space up to the next intersection, then entered an 18-inch pipe. They remained inside these two pipes for a total of 750 feet before veering left into the Morley drainage. In the 15-inch pipe especially, the smugglers moved in half-inch thrusts achieved only after exhaling provided the shoulder room, all the while pushing or dragging suitcase-sized dope bundles ahead of them. Pittman knows what it was like inside the 15-inch pipe. He explored it himself. "I wasn't able to crawl," he says. "I had to extend my arms out in front of me, push forward with my toes and kind of contort myself. It was painful." With no room to turn around, he had to crawl out backwards, and there was no Plan B, such as a cable to yank him out in the event of a cave-in. It wouldn't work anyway. The curve of the pipe would pin him against the side. "It's like a lobster trap in there," says Pittman. "Easy to get in, hard to get out." He did this work with an audience: 10 minutes after Border Patrol discovered the International-Nelson tunnel, Pittman says, smugglers on the other side knew about it. He could see two men peering through the fence at him as he cork-screwed down into the 15-inch drainage pipe. As soon as he was inside, they turned on water to flood him out, forcing him to squirm along in 2 inches of mud and muck. When he emerged from the hole, Pittman saw the same men talking on cell phones, likely planning their next effort. "They watch what we do 24 hours a day, and know everything we know within minutes," says Pittman. "As soon as we bust one tunnel, they start work on another. It's crazy." Kelly says the gangsters who make use of tunnels are "very sophisticated people" who run their cartels like Fortune 500 companies, with a CEO at the top, layers of responsibility on down, and a special lieutenant in charge of tunnels. "If they're successful getting their narcotics into the U.S., they're going to make a lot of money," he says. "Mexico has the supply, and the demand is here. 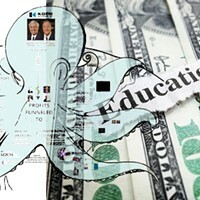 It's sheer economics."